You are here: Home / Digital Pianos / Kawai ES-100 vs Yamaha P-115: Which is Best? Kawai was established in 1928 by Koichi Kawai and has evolved from making high-end concert pianos to creating reliable digital pianos. Keeping consistent with their quality, the company has proudly stood behind the Kawai ES-100 for the past couple of years. And there’s good reason too—not only is it one of the better digital pianos priced under $1000, it’s also one of the better selling portable pianos, as well. Yamaha, on the other hand, is well known for its “P Series” pianos. 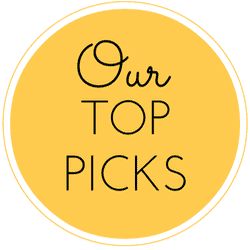 Typical characteristics of these digital pianos include high quality sound, a myriad of voices options, and graded hammer technology that can be appreciated by a wide range of experience levels. A recently added piano to the series is the Yamaha P-115 (which takes over the reins of its predecessor—the P-105) with vibrant sound and rich tones. At the moment, the P-115 is selling at a MSRP of $600, making it one of the most high-quality affordable digital pianos from Yamaha or any other company. The P-115’s design is best described as compact and stylish, similar to other models in the P Series. This piano can be integrated into any home décor accompanied by a sturdy black or white frame. It can also accommodate three pedals. 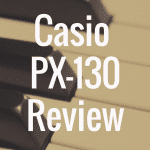 While the ES-100 features a slot for sheet music, the P-115 has an actual music rest for your sheet music. So, I know what you’re thinking. All of what was mentioned above sounds great, but which piano should I buy? And why? Well don’t worry, we’ve got you covered. In this comparison article, we’ll dive deep into both pianos, discuss their similarities and differences, and provide our opinion of which piano we think is likely a better buy and why. 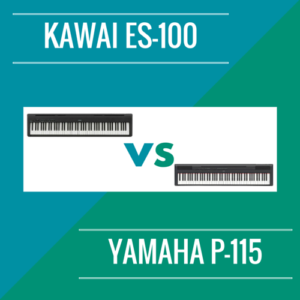 Be sure to use the interactive table below to compare the Kawai ES-100 to the Yamaha P-115. You can even compare these two pianos against other popular pianos like the Korg SP170s and Yamaha DGX-660. Even though both pianos were produced by different manufacturers, they are competing in everything from features, to sound and price. The dimensions of the Kawai ES-100 differ only slightly from Yamaha’s P-115. The Yamaha P-115 is taller by less than an inch, and wider by about the same. This should of course never be the ultimate deciding factor between pianos, but we felt it was worth noting. Each piano features a “dual” mode that allows for each side of the piano to sound like a different instrument. This adds extra depth to any piece, so you won’t be missing this feature regardless of which piano you choose. “Split” mode also makes either piano ideal for a classroom setting or for duets as the keyboard becomes two pianos, split right down the middle. Another great feature for learning in or out of the classroom is the internal recorder. This allows for you to play your music, record it, and play it back. You can listen and see where you can improve or record a progression on one hand and play along with the other. The P-115 allows you to record 1 song with a capacity of approximately 11,000 notes. The ES-100 accommodates a little more with enough space for 3 songs, approximately 15,000 notes memory. The P-115 allows for 2 tracks, while the ES-100 only allows one. On the top of Kawai ES-100 are two 7W integrated speakers. This is near the top of the chassis by the slot for the music rest. At the back, you’ll find the MIDI I/O, the damper jack, and an input for the AC adaptor. There are two outputs for phones that can be used to connect the piano to a P.A., mixer, or another electronic device. On the P-115, you will find two true circle speakers that produce full low frequencies and pure bright tones in the higher keys. By itself, it’s a very pure sounding quality but the Kawai ES-100 holds strong in this area. Because even though the wattage is the same, there are two speakers on the ES-100 that are larger than the P-115’s—and the sound is notably great. In fact, for the ES-100, Kawai utilizes the Harmonic Imaging sound engine that lends to the outstanding natural sound with the AHA IV-F keyboard. Included with this is pedal resonance and string resonance that can be adjusted through the function menu. There’s Fallback Hammer Noise and Damper Rail Noise that are similar to that of a real grand piano. When playing this piano, I felt that the velocity was extremely sensitive but highly responsive as the harder and faster I pressed the keys, the louder it was. In contrast, the P-115 uses the Pure CF sound engine using Yamaha’s CFIIIS concert grand piano. For those who don’t know, this piano has been heard around concert halls around the world. The P-115’s sound is very vibrant and does a strong job of being fairly representative of an acoustic piano (as much as a budget, portable piano can do, of course). It definitely surpasses most of its predecessors and competitors in this category, however. The Graded Hammer Standard keyboard features matte finish on the black which the ES-100 does possess. And in terms of touch and feel, I am in favor of the matte finish, though the key action on the ES-100 appears to be more realistic and respond better than the P-115. The ES-100 offers 19 different sounds including 8 different piano tones to choose from. A couple of my favorites were the Concert Grand and the Rock Piano. 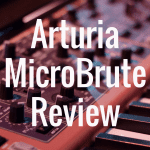 A couple other sounds include two Strings, two Bass presents, Vibraphone samples, and three Electric Pianos. There are a lot of possibilities with these sounds, especially since you can layer different ones on top of each other, as well as adjust the reverb and EQ in the advanced settings. There is not duet mode or automatic accompaniment on the ES-100, but there are a variety of drum rhythms (approx. 100) for layering. Only on the Kawai ES-100 will you find the lesson mode equipped with the library based on Alfred’s Song Books and Bergmuller 25 Etudes. There are some great sounds on the P-115 too, including the Grand Piano, Bright Piano, Rock Organ, and the Wurlitzer. 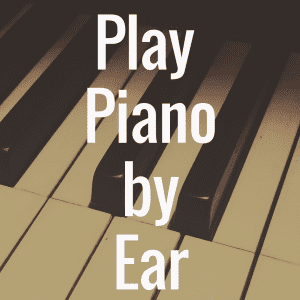 Something that was a little funny within the piano styles is a function that plays a chord according to a chosen style like “boogie woogie” for a lively accompanist. Unlike the ES-100, there are layering features that will allow you to enhance your performances or expand your tonal range. The Kawai ES-100 weighs in at only 33 pounds, making it highly portable. Along with easy handling, the 88-keys are of Advanced Hammer Action (AHA) IV-F graded hammer action that feels great underneath the fingertips. The Yamaha P-115 weights about 26 pounds, which makes it even better for transport. It’s also part of Yamaha’s P series, automatically qualifying it as a portable digital piano. The keyboard features 88-weighted keys using Graded Hammer Standard and a matte finish on the black keys. The touch alone and look is great on the P-115, but I’m not sure if it’s enough to beat the Kawai ES-100 and it’s great sound and feel. The F-10H damper pedal that accompanies the Kawai ES-100 is extremely solid, too. It’s a heavy-duty piano-style pedal that accommodates half-pedal functionality. Pedals aren’t extremely important to everyone, but for those who like to add depth to their pieces and truly take advantage of polyphony, this is a great additional product that comes in the box with your digital piano. The P-115, however, offers MIDI and USB ports that are not available on the ES-100. There’s also a feature called the “Digital Piano Controller” app for iOS devices that allow the player to control the keyboard from their preferred device. Even though the ES-100 doesn’t offer this feature, keep in mind that the P-115’s connectivity options are not wireless. Another performance feature that gigging musicians would benefit from on the P-115 is the “sound boost” feature that adds treble to your passages. Anyone that’s performed with a live band can admit to losing their presence in the sound from time to time. With this feature, the piano will effectively cut through the surrounding instruments for more of a impactful presence. Which Piano Is Better for Your Needs? The Kawai ES-100 was primarily designed with piano students and intermediate level players in mind. Popular features that the Kawai ES-100 missed are the USB port and the LCD display. 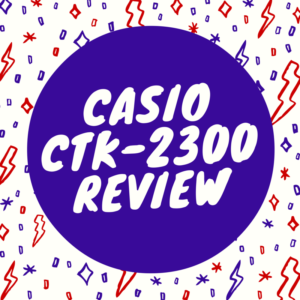 Companies like Casio are starting to implement more technology features in lower price ranges, therefore making features like these quite competitive. Do not lose out on what the ES-100 has to offer just because there is no LCD display. 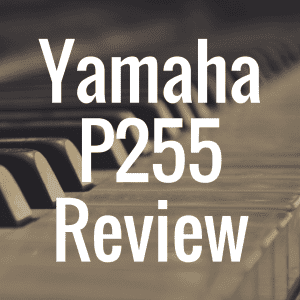 Sure, the Function and advanced settings can seem a little tedious in comparison to what we should expect in this day and age, but it’s a fantastic intermediate-level piano that is sure to perform. Yamaha’s P-115 is great for a beginner player, or even a musician that’s always on the go. It’s got the connectivity options, along with special EQ and sound effects that will help you out on stage. Both the Kawai ES-100 and Yamaha P-115 are great for their respective audiences. Even though I believe the sound quality is much more pleasant on the ES-100, it’s clear that Kawai would need to add a few features should they want it to be eat a little bit into the P-115 (and to that extent, the P-255’s) market. But of course, Kawai makes other portable pianos to do exactly this. If you’re deciding on what piano will make a better home instrument, or are simply looking for a great, practical, and portable or piano, the Kawai ES-100 is likely to be your best bet because it gives you a lot of bang for your buck. On top of that, it’s a piano that I feel you can grow with over time, which is important. Because after all, you don’t want to feel like you need to purchase a brand new piano because you’ve outgrown your very first one in such a short time span. Still, it should be noted that both of these pianos are good for what they’re intended to do. If you are a beginner, and someone who doesn’t really want to spend too much money, I think you’re better off going with the Yamaha P-115 (or even the P-45). Perhaps that piano will satisfy all of your needs, and if not, at least you will have learned the basics of playing piano before “graduating” to a more expensive model. 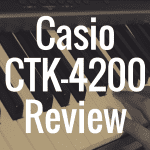 If you felt this review and piano comparison was helpful, please “like us” on our Facebook page! Yamaha P-115 vs Yamaha P-55: Which is Better?